Most likely, when you picture a dinosaur in your mind, you don’t picture it alongside humans. Instead, you imagine what you have seen in pictures from childhood—pictures that were created by evolutionists. According to Genesis chapter one, humans and dinosaurs were created together on day six of Creation in an environment that was much different than the one portrayed by evolutionists. It is likely that humans actually interacted with dinosaurs, and in some cases, may have even tamed them for human use (James 3:7). 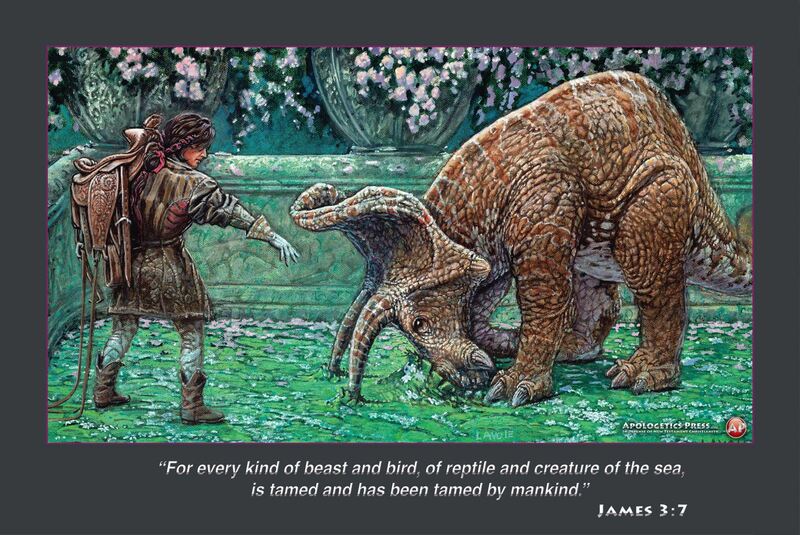 After all, humans, from the beginning, were commanded to “subdue” and “have dominion over” the Earth and “every living thing.” “A picture speaks a thousand words.” It’s time our children were given more accurate portrayals of how life on Earth with dinosaurs could have been. To that end, we have been authorized to print “Down,” one of the beautiful art pieces of Lewis Lavoie, who illustrated AP's kid's book Dinosaurs Unleashed, and have created a poster format with a relevant verse that can decorate a wall in your home.